Students may register for classes on campus or online. To register on campus, students should meet with their academic advisor to select appropriate courses and fill out a registration form. This form, signed by an academic advisor, should be submitted to the Registrar’s Office on either campus. Barring any conflicts with restricted or full courses, registration staff will enroll students in the selected courses. To register online, it is important to speak with an academic advisor prior to registering. The academic year consists of a fall and spring semester, each approximately 16 weeks. Summer term consists of two accelerated sessions beginning in late May and mid-July and one10-week session. Winter session is held in early January and provides an opportunity for accelerated study. MassBay programs lead to an associate in arts degree, an associate in science degree, or a certificate. Completion time will vary depending upon the requirements of the degree program/certificate and the number of courses completed each semester. MassBay recognizes federal regulatory language, defining a credit hour as an amount of work represented in intended learning outcomes and verified by evidence of student achievement that is an institutional established equivalency that reasonably approximates not less than: (1) One hour of classroom or direct faculty instruction and a minimum of two hours of out-of-class student work each week for approximately 15 weeks for one semester or trimester hour of credit, or ten to 12 weeks for one quarter hour of credit, or the equivalent amount of work over a different amount of time; or (2) At least an equivalent amount of work as required in section (1) of this definition for other academic activities as established by the institution including laboratory or studio work, internships, practica, and other academic work leading to the award of credit hours. A full-time student is defined as one who is officially registered in twelve (12) credit hours or more in any academic semester. A part-time student is defined as one who is officially registered in eleven (11) credit hours or fewer in any academic semester. When students audit a course, they are expected to attend class regularly but do not receive college credit. The course instructor will decide the extent to which students will participate in class assignments. To audit a course, students must designate an audit status at the time of registration. A record of the audit shall be entered on a student’s transcript as “AU” at the time of registration. It cannot be converted to a letter grade. Audited courses require full course payment. Students seeking to change from one academic program to another must meet with an advisor and complete a Change of Major form, available in the Registrar’s Office or the Advising Center. Once a student’s change of program request is approved, he or she will matriculate and follow the curriculum and course requirements in place for that program at the time of their change in major. In some instances, students’ science and/or computer science courses may not apply to their new degree depending on the time of completion of these courses. Students may add or drop a course without penalty until the end of add/drop period in each semester. Generally the add/drop period extends through the first week of classes, but evening, weekend, and off-cycle classes may have different add/drop periods. For the add/drop dates in a given semester, consult the official academic calendar for that semester, or the Office of the Registrar. Students may officially withdraw from a course after the add/drop period has ended. The last date students may withdraw from a course is published in the official academic calendar each semester. Students who wish to withdraw from a course must do so online or complete the withdrawal section of the College’s Add/Drop/Withdrawal form, available at www.massbay.edu/registrar or in the Registrar’s Office. Students who withdraw from a class will receive a grade of “W” on their transcript, which is not counted in the GPA calculation. Lack of attendance or course abandonment does not constitute automatic or official course withdrawal. Students who do not officially withdraw in accordance with College procedures are subject to full payment of tuition and fees, and may receive the failing grade of ‘F’ for the course. The official withdrawal date is the date all forms are completed and turned into the proper office, or the system date if the official withdrawal is conducted online. Frequent withdrawal from courses may affect a student’s academic standing and financial aid status, among other ramifications. Students may repeat a course at any time, although MassBay reserves the right to limit the number of times students may repeat the same course. When a course is repeated, the new letter grade, whether higher or lower than the original grade, is used to calculate the GPA and is listed on the permanent record. The original grade will be retained on the permanent record but is removed from the GPA calculation. Science and computer science courses completed at MassBay, or granted as transfer credit within five years of enrollment, may fulfill graduation requirements regardless of a change of program as long as the student has not had an interruption of enrollment of two years or four semesters. If students interrupt their MassBay studies for longer than two years or four semesters, and their science and/or computer science courses are five years or older upon readmission to the College, those science and computer science courses will not be accepted toward graduation. The permanent academic record of students listing all courses taken and grades achieved is documented on a transcript. An official transcript (one bearing the seal of the College and signature of the Registrar), can be mailed directly to the institution or persons considering the applicant for admission or employment, only upon receiving a written request from the student. No transcript or record will be released without the signature of the student to whom the record belongs. A Request for Transcript form is available in the Registrar’s Office or online: www.massbay.edu/registrar. Students may obtain an unofficial transcript (an academic record without the College seal and signature of the Registrar) via Bay Navigator. The number of hours per week that courses meet are counted as equivalent credits for financial aid and used to determine a student’s status as a full or part-time student. Credit hours are units earned for successfully completing a course during a given semester. The number of credit hours associated with each course is listed in this Catalog in the course descriptions section. At the end of each academic term, students receive a grade in every credit course in which they were enrolled. A letter grade is assigned for each credit course completed. Each letter grade carries an honor point value. These grades represent levels of accomplishment and carry the number of honor points per credit hour attempted, as indicated in the letter grade chart. This honor point value is multiplied by the number of credits earned for a particular course. Each semester you receive a semester Grade Point Average (GPA) based on the classes you took that semester, and a cumulative GPA which accounts for all of the college level courses you have taken up to the current date. The GPA is calculated by dividing the total number of points earned by the total number of college-level credits attempted. The GPA affects a student’s academic progress with regard to graduation, academic honors, probation, and dismissal. During the mid-point in the fall and spring semesters, faculty submits grades as indicators of student performance. If a student’s mid-year grade is a “D” or “F”, or a “C-” in Health Sciences courses, he or she should meet with their instructor and academic advisor to review options for improvement. Final examinations are given in most credit courses. If a student is absent for a final examination, he/she should immediately contact the class instructor to request a makeup exam. It is up to the instructor whether a make-up exam is allowable, and the circumstances under which it may be given. Although the following letter designations are not used in computing grade point average, some of them may have an impact on a student’s financial aid status: W, WC, WR, I, UC, AU, S, U,T. W (Official Withdrawal): From the day after the end of the add/drop period before the end of the twelfth week of fifteen-week courses, the fourth week of six-week classes, the sixth week of eight-week courses, or the eighth week of ten-week classes in any semester, a student may withdraw from a course without penalty. The notation of “W” will be made on a student’s permanent record. WC (Withdrawal from the College): When a student officially withdraws from all courses and files the appropriate notification with the Office of Student Development, the notation of “WC” will be made on the student’s permanent record for these courses, indicating official College withdrawal. WR (Administrative Withdrawal): When there is no record that a student ever attended a course for which they were enrolled or if a student stopped attending a course but did not withdraw, the notation of “WR” will be made on a student’s permanent record for that course. The “WR” designation will be accompanied by the student’s last known date of attendance. I (Incomplete): A temporary designation assigned to a student if he or she fails to complete the requirements of a course. An “I” designation may result from one of two causes: failure to take a final examination, or failure to complete all the required assignments. If a student received an “I,” he or she should contact the instructor and obtain, in writing, the requirements for course completion. A student may be given up to one semester after the semester in which the “I” was assigned to complete all course requirements. The designation of “I” automatically becomes a Failing (“F”) grade if a student does not complete the missed work within the following semester. UC (Unsafe Clinical): Unacceptable performance in a clinical assignment. AU (Audit): This status is assigned to a student who requests to register for and participate in a credit course on a no-credit basis. A student may audit any credit-bearing course at MassBay, but he or she must state their intention to audit the course on their registration form. Audit status cannot be changed after the drop/add period. S (Satisfactory): Acceptable performance, equivalent to the grade of C or higher, in a pass/fail course or exam. U (Unsatisfactory): Unacceptable performance in a pass/fail course. T (Transfer Course): Course credits transferred from another college. Completion of the “Application for Graduation” form online or in the Registrar’s Office. Completion of program requirements, including all credit hours and Grade Point Average (GPA) requirements, of the particular academic program. At least 25% or one quarter of the coursework must be taken at MassBay. An overall cumulative Grade Point Average (GPA) of 2.000 or better. Fulfillment of all College obligations, including financial, as well as completion of all exit forms by students receiving financial aid. Students must complete the College’s exit survey. Course requirements for graduation are specified in this catalog under your program of study. Please Note: The College reserves the right to confer degrees and certificates once graduation requirements have been met. Students must complete the graduation application by the defined deadline. If a student does not complete the graduation application by the stated deadline, their application will be reviewed for the following semester. Students that are currently active in a major (degree or certificate) may change their major by completing a Change of Major form with an academic advisor. A student must be active in the major during the term in which they plan to graduate from that major. Please meet with your academic advisor regularly to ensure you are active in the right major. Submitting a change of major form after the deadline will result in the effective date of the new major being the next academic term, and awarding of the certificate or degree in the next academic term. Students that are currently active in a degree or certificate program may add an additional major (degree or certificate) by submitting an Admission application to the Office of Admissions. A student must be active in the newly added major during the term in which they plan to graduate from that major. Please meet with your academic advisor regularly to ensure you are active in the right major/s. Submitting an Admission application for the purposes of adding an additional major after the deadline will result in the effective date of the additional major being the next academic term, and awarding of the certificate or degree in the next academic term. Grades reported by the instructor are considered permanent and final. There are, however, some circumstances in which a change of grade may be requested to correct clerical or procedural errors. Students must submit a written request to the instructor for re-evaluation. The final decision regarding grades rests with the instructor. However, students may appeal a grade by following the grade appeal process as outlined in the Student Handbook. No appeal challenging a grade may be initiated later than 30 calendar days following the last day of the instructional period for which the grade was granted. Students are expected to attend all scheduled meetings of the courses in which they have enrolled, and they are responsible for any work missed due to absence. For each course, the policies regarding class and/or laboratory attendance and make-ups (if any) are developed by the instructor and will be specified in the course syllabus. The course instructor has full and final authority to allow make-up work. If student absences exceed five (5) class hours, the instructor may withdraw him/her from the course by notifying the Registrar with the student’s last known date of attendance. This action will result in the recording of the “WR” designation for course abandonment on the student’s academic record. Lack of attendance or course abandonment does not constitute automatic or official course withdrawal. Students who do not officially withdraw in accordance with College procedures are subject to full payment of tuition and fees, and may receive the failing grade of ‘F’ for the course(s). The date of official withdrawal is determined by the date all forms are completed and turned into the proper office, or the system date if the official withdrawal is conducted online, via Bay Navigator. Frequent withdrawal from courses may affect academic standing and financial aid status, among others. Under the Massachusetts General Laws, Chapter 151C, any student who cannot attend classes or take an exam, study, or fulfill work requirements on a particular day due to his or her religious beliefs shall be excused from such a scheduled obligation. Students must be provided with an opportunity for make-up as long as it does not create an unreasonable burden upon the institution. At each semester’s end, MassBay reviews student academic performance. The College requires students to complete each semester with a minimum cumulative GPA of 2.000. Students who fail to meet the minimum GPA are subject to probation or dismissal. Grades in pre-college-level courses are not included in calculating the GPA or in the calculation of credits toward graduation. To be eligible for the Dean’s List, students must be full-time, enrolled in least 12 credits of college-level courses, in good standing with the College, maintain a 3.500 term GPA or higher, and have no course grade lower than 2.000 at the end of an academic semester. Only college-level course credits and grades are used to compute the term GPA for the Dean’s List. If a student has any incompletes for the semester, even if he/she eventually completes them, he/she will not be eligible. Dean’s List eligibility is not retroactive. Students who are called to active U.S. military duty shall, upon verification, be granted exceptional consideration for making up any missed work should their service cause a temporary interruption in the semester. Students who are unable to complete a semester because they are called to active U.S. military duty shall, upon verification, be granted non-punitive withdrawals in all courses from which they are required to withdraw. Students may also submit a Student Financial Petition for a full, or partial, refund with the Office of Student Accounts. For verification, students must provide the Dean of Students, Registrar, or Veterans’ Counselor with a copy of their Order to Active Duty within one week of receiving the Order. Students who have received any form of financial aid, including a scholarship or student loan, or who expect to receive such, must contact the Office of Financial Aid and the Veterans’ Counselor to make arrangements. MassBay is committed to the continual improvement of the quality of education at the institution. The periodic evaluation of instruction by students is an important component of this commitment. Student evaluations are conducted during a designated period at the end of each semester. More information is available in the Office of Strategic Planning, Institutional Effectiveness, and Grants Development. Students enrolled in health sciences programs must complete all science courses with a grade of “C” or “C+” or better, depending on the program. Science courses must be repeated if they were taken more than five years before the time of application to the health sciences programs. Students who are uncertain of the validity of their science courses should consult with an academic counselor in the Academic Advising Center. Student placed on probation should meet with their academic advisor to discuss MassBay’s support services, which can help improve academic performance. While on probation, students may not participate in any extra-curricular activities, including athletics. In addition, he or she must immediately resign any position of responsibility, including the Student Government Association (SGA), Student Trustee, etc. Students may attend social and academic functions, as well as participate in work-study. Once on probation, students must earn a minimum cumulative GPA of 2.000 in one annual academic cycle (two academic semesters). Failure to achieve the above standard will result in dismissal from the College. Academic dismissal means that students are prohibited from enrolling in the College. If a student is dismissed, he or she may appeal their status with the College Appeals Board. Students intending to withdraw from class(es), whereby there are no remaining classes for the enrolled semester, must meet with the Dean of Students to complete the withdrawal process. The withdrawal date is determined by the date all forms are completed and turned into the appropriate offices. MassBay graduate entering a new program. Interruption of academic program of more than four semesters or two years. To reapply to the College, contact the Office of Admissions or the Academic Advising Office for appropriate procedure and forms. Students who are dismissed from an academic program or the College may appeal for reinstatement through the College Appeals Board process. Appeal forms are available in the Office of Student Development. Students may only appear before the College Appeals Board one time for reinstatement. All associate degree programs include at least 21 credits of general education requirements from the arts, humanities, mathematics, sciences, and social sciences. Please refer to individual curriculum sheets for program requirements. 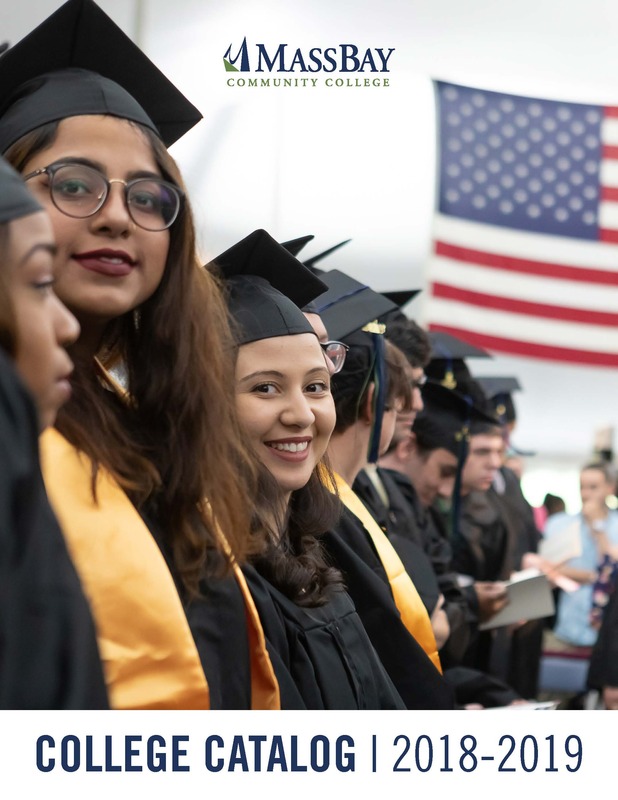 Associate degree candidates for graduation whose cumulative grade point average is 3.700 or above will graduate with Highest Honors; those with GPAs of 3.500 - 3.699 will graduate with High Honors.